The program addresses how price-based competition is beat by a multinational corporation; contracting in 'fair trade' with Bangladesh textile factories. Designers in developed countries outsource manufacturing to suppliers in developing countries. 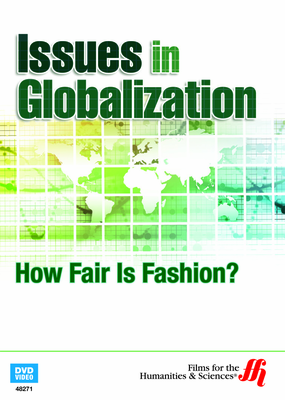 The economics of fashion play a significant role in free trade policy reforms. Consumer driven global production models that place demand for price over labor capital, suggest that low paid, work intensive manufacturing processes do not result in a trade equilibrium once hedonic measures of value are employed. Both real wages, and work conditions effect the stability of laborers in third world countries. With corporate social responsibility (CSR) at the forefront of multinational strategic decision, the ethical considerations to General Progress Indicators (GPI) supplant, or at least offer an alternate index to the Gross Domestic Product (GDP) or other standard indices such as the Gross National Product (GNP) for sustainable market reporting. If compliance rules control risk to regulated limits, it is difficult to argue inequities persist where strategic competitive CSR campaigns exist, as the dual ethical and legal framework to corporate behavior in free trade zones is at once and at the same time obscured by policy language, yet transparent in conformance. Economic development mechanisms impacting developing workforce capital in developing countries are also supported by the non-adversarial buyer–supplier export contract relationship. The production and reputational benefits in the establishment and credibility of CSR practices, then is maintained through a complex dialogue of regulatory rules, ethical policy, and real legal contract. In How Fair Is Fashion? Issues in Globalization (2011), offers case study pf fashion enterprise from both a global fashion house and a Bangladeshi textile manufacturer’s perspective.